OK, one last cold weather picture. 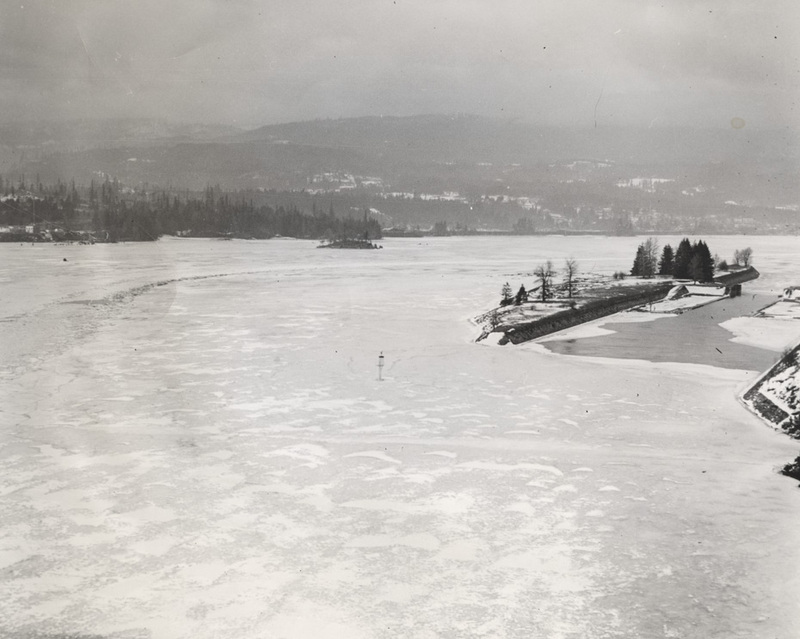 This picture of the Columbia River frozen over at Cascade Locks is from the 1950s. The Bonneville Pool has already caused the locks to be decommissioned. We've talked before about how the dams make it harder for the river to freeze: turbulent flows let the river cool off faster in cold snaps. The dams reduce the turbulence in the winter, so the river stays a little warmer. I don't know if the river has frozen in this area since the Dalles Dam was constructed. The combination of the two dams seems to be enough to make that rare event much rarer. I won't say impossible, or it will happen next winter. This gives one a very good view of "Thunder Island." I don't know about this area, but I have seen the pool right behind Bonneville Dam frozen solid. Must have been the winter of 1968-69? My mother-in-law used to tell us about riding in an old Willys Jeep with her brother out on the frozen Columbia under the Hood River bridge in the mid-50s. That was the last time she remembered the Columbia freezing over in this area.